"A woman said: I would go to Rome to seek fashion, if it were required. What is this fantastic goddess who commands so imperiously? It is at her very express desire that everything is done, that plumes fall and rise, that hats take all sorts of forms, that the robes à l'anglaise, the chemise gown, the robe à la turque, the pierrot, the caraco have appeared alternately on the scene: that the kerchief that is very full on the neck, called the deceitful kerchief, gave the idea of a protruding throat. 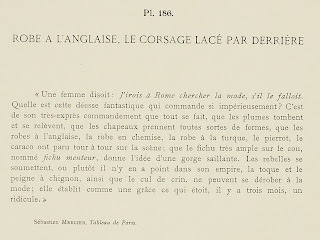 Rebels submitted, or rather there were none in fashion's empire, for the toque and the chignon comb, together with the horsehair cul, could not be escaped in fashion; she gracefully established what was, three months ago, ridiculous." Sébastien MERCIER, Tableau de Paris. * I have agonized a little bit over this section of the caption. 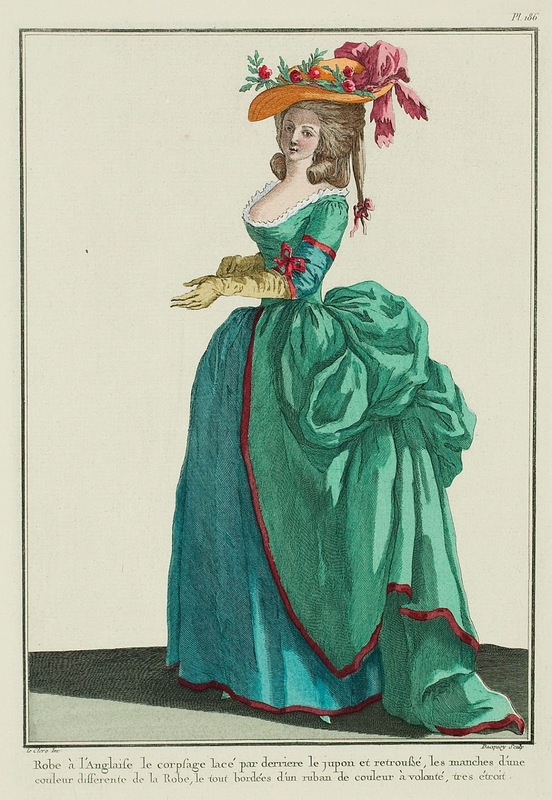 With the lack of punctuation, it could be saying that the bodice is laced closed in the back and the skirt of the gown (technically, normally written as le bas de la robe with le jupon being the petticoat, but here the petticoat is clearly not rétroussé at all) is tucked up, but it could also read "the bodice is laced, in the back the skirt is tucked up". Due to the word order and the plain front of the bodice, I've gone with the first as my official translation, which fits with the back closing fourreaux that seem to have appeared in high fashion in 1784. There are high-fashion variants, though, and should not be taken as proof that back-lacing gowns were commonly worn by all levels of society. 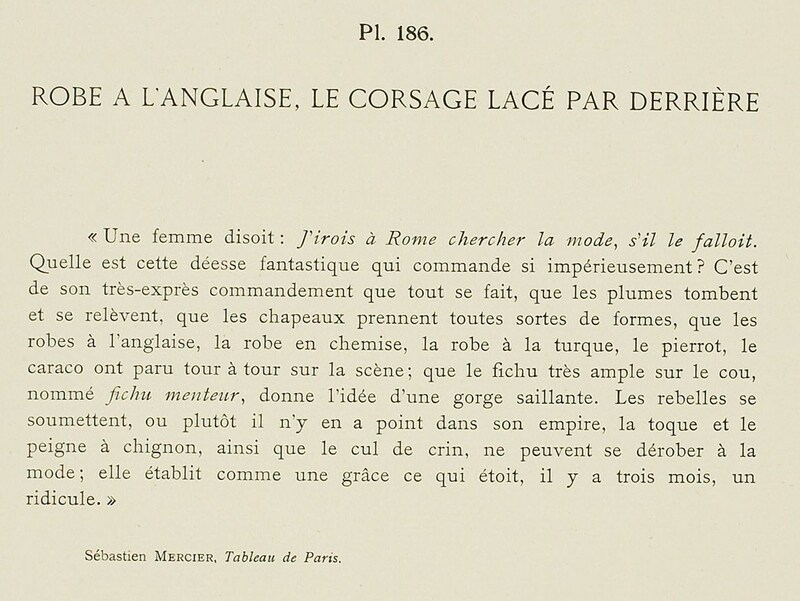 well, it actually says : "the bodice laced in the back behind the petticoat and tucked in". Yes it says it is the bodice that is tucked. I always thought this plate was the most stupid I have ever encountered. But that makes even less sense! Oh, fashion. Une vrai beauté. Les couleurs se marient très bien.